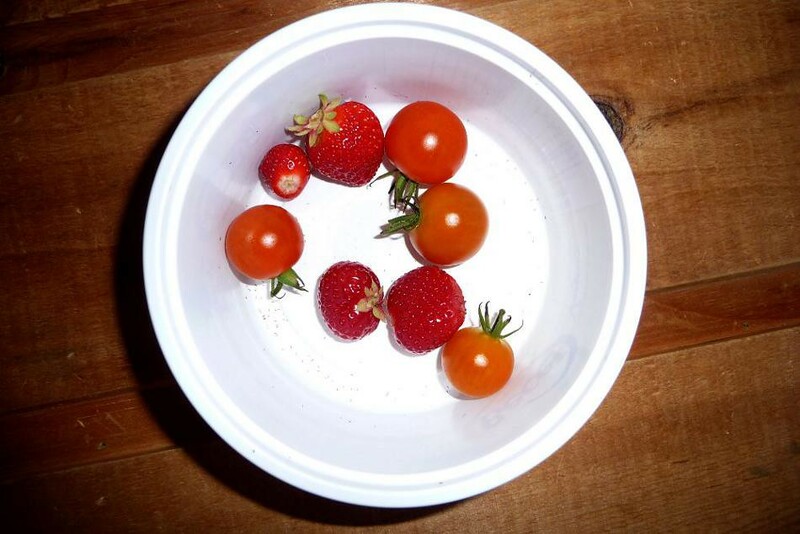 We are still harvesting strawberries from our day-neutral plants! In future, I wouldn't get day-neutral varieties, because they produce such a small crop, but it is cool harversing strawberries at the end of September. The cherry tomatoes are pretty good, too. In this house we call that grazing, not harvesting, they'd never make it as far as the house. We'd thoroughly enjoy them all the more for it. I assume your "day neutral" strawberries are the same as our "ever bearing" ones. I grow my strawberries in a hydroponic pipe in a greenhouse and growing standard strawberries for one or possibly two flushes of fruit would be a waste of space. So I have always grown ever bearing ones and there are several varieties that produce the normal huge fruit that you see in shops, although some are not particularly flavourful. I grow a variety called Mara des Bois which is a cross between an alpine strawberry and a normal ever bearing one and is very tasty. It produces normal sized fruit more or less continuously from April to November, although they are not very sweet in November due to lack of sunshine. I have strawberries in my breakfast muesli every day. Here is today's pick, at this time of year it's about once a week, but every other day in summer. We freeze a lot as well as I love mushy strawberries during winter. year I planted a "runnerless" variety called Pink. It fruited OKish but not as heavily as the older varieties and with smaller fruit. This variety forms tightly matted clumps rather than runner but they are still daughter plants as far as I am concerned. Anyone with experience of these types and breaking the clumps up for new plants? Yes. "Day neutral" and "everbearing" mean the same thing. year I planted a "runnerless" variety called Pink. Anyone with experience of these types and breaking the clumps up for new plants? One of our two varieties seems to be a runnerless type. I am not really happy with it, and prefer the other one, which, this year, is shooting out quite a few runners. We only have a handful of the runner type, so I am counting on the runners to propagate them. It produces more, larger fruit, too. I agree Kathy, the runnerless variety I have (no doubt different to yours) is certainly inferior in all aspects. This is why I removed it from the main bed, broke up the clumps and planted the "daughter" plants in a "one last chance" bed on their own. I am of a slightly different opinion. The main variety I grow is Mara des Bois which is day neutral and runnerless. I have tried many, many "new" European commercial varieties and found most of them of them wanting. The main traits for these varieties are shelf life and the ability to put up with rough handling without bruising. All that I've grown tend to be rather tasteless, overly sweet and firm to the point of being hard. I do grow conventional varieties, Royal Sovereign and Cambridge Favourite grow wild smothering by "herb" garden (only the mint can compete) plus a modern variety Honeyoye which I grow in troughs in my conservatory for extra early crop, and then pot up runners for the next year, so that they are always less than a year old. That of course is the benefit of growing your own, growing what suits you rather than what suits supermarkets. We are into the variety thing again; I simply cannot get your varieties here even under other names even though there are about 30 varieties in the marketplace here. It seems the only day neutral variety available is "Melba", an Oz bred variety - I can get "Cambridge Rival" through one supplier and it has good reviews. The old standby "Red Gauntlet" probably the best available for our hot, dry climate though. Otherwise it is the commercial varieties and I heartily concur with your views on those. I just had a quick look and there must be at least a dozen everbearers available. It seems also that commercial growers are switching to everbearing varieties, which makes sense for the same reason I grow them. If you plant up a hydroponic system under cover as they seems to now in the UK, then you want them to fruit as long as possible. So at least 3 varieties are suitable for supermarket "quality". I grew Finesse a few years ago and they produced some runners just as the fruiting started, which I cut off, only to find they didn't produce any more. I didn't grow them at 33,300 to the hectare though, but they did have very nice fruit on long stemmed trusses which kept the fruit clear of the trough compost, and would also keep them out of the hydro pipe. Well, I ate the last strawberry out in the garden, and then put them all to bed for the winter, with some compost and a layer of straw mulch. It was a much better season than last year. Last season my strawbs did not perform at all - small fruit and not many of those. This year I into set up dedicated beds with a range of types *(yes, the one available here are different to the Northern ones so type is more important than variety and yes, I was trying to grow in a massive drought with plus 40c temps) However I have read conflicting info re watering from above Vs below, shade or sun and fertilising. So, before I embark on construction, whats the secret to success? The weather I suspect followed by a soil that the plants like. As I said earlier in this thread, I grow my strawberries hydroponically, have done now for 6 years. It works very well and could be the answer to your drought problem. There is much reduced evaporation as the plants only take what water they need and the excess is drained back for subsequent automatic waterings. Plus it's easy to set up under cover, a greenhouse in my situation and a shade house in your's maybe?